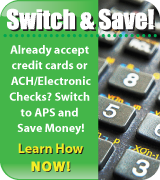 Save on Credit Card Processing, ACH Processing and Check Verification. If you currently have credit card processing, ACH processing (Electronic Checks), real time check verification or any other related service we can reduce your transaction cost and add to your bottom line. Especially in this day and age with economic hard times cutting operating cost can make a big difference. Access Payment Systems understands this and seeks to help businesses through these tough times, which in turn helps us. In addition to beating your processing rates and reducing your transaction cost Access Payment Systems will switch you over to our services FREE of charge. It’s a no brainer! In order to take advantage of this offer we will need 3 months of your most recent credit card processing statements. Fill in the inquiry form on our Contact Us page and fax the statements to the attention of the Sales Department at 720-263-4448. Make sure to include a fax cover sheet with your company information so we know the statements belong to the inquiry form you filled out on the Contact Us page. Once we receive the statements we may call you to follow up with some questions about your business and after reviewing your current pricing structure. Then we will send you a proposal outlining the cost comparisons and the savings you will receive. It’s that simple. Give us a shot! You have nothing to lose but the money you can save.